The Bye Bye Standby is a revolutionary new ''smart socket'' that allows devices to be taken off of standby whenever they are not in use, saving users both money and energy. By simply pressing a button, appliances and other electronic devices can quickly and easily be turned off, either by remote control or wall switch, when you go to sleep, leave for vacation, or just head out on the town for the evening. > The capacity to handle larger appliances, including plasma TVs and audio-visual systems. > The casing is more heavy-duty and easier to use in electric sockets that are mounted close to the floor or recessed into the floor. > It is now much easier to install a new battery in the remote. > Can be programmed to work with existing controllers, including the Bye Bye Standby wall-mounted switch, motion sensors and other remote controls. > Can be operated remotely using the Online Controller. > Can be programmed to automatically turn devices on and off. > New products (including Smart Sockets and Powerdown Strips) are designed for use in the UK, the rest of Europe, North America and Australia/New Zealand. In addition to being good for the environment and your pocketbook, the Bye Bye Standby is also useful for making it appear that someone is home when the house is empty, as lights can be turned off and on randomly. 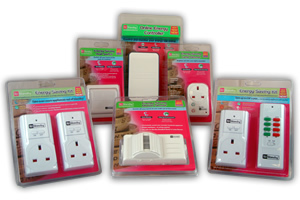 To use, you just plug electrical devices into the socket - it's that easy! The starter kit consists of one socket and one remote control, but please note that the new remote will not work with previous editions of the Bye Bye Standby sockets or lamp dimmers. Expanded starter kits with two additional sockets are also available. Official website with full Bye Bye Standby product list.